In my time following Wales before this campaign, we have seriously threatened to qualify for a tournament twice. The first time was in 2003, a campaign which included a 2 – 1 win over Italy – my favourite Welsh game from the day it happened until the 12th June 2015. After looking as though we may top the group and qualify automatically, a slump at the end of the campaign meant we had to settle for the playoffs. We could have drawn Norway, Slovenia, Latvia or Scotland, but of course we got Russia. The team produced a heroic performance in Moscow in a 0 – 0 draw, but a 0 – 1 defeat at home meant we were resigned to watching a tournament on television once again. It later emerged that the Russian player who had set up the winning goal had failed a drugs test, but of course UEFA did nothing about it and the result was allowed to stand. The second time was more recently, in the build up to the World Cup in Brazil. I didn’t agree with the appointment of Gary Speed at the time, but he very quickly proved me wrong – bringing a passion and togetherness to the Welsh side which we are still reaping the benefits of today. The revival came too late for Euro 2012, we lost our first four matches and were one of the very first nations eliminated. However, we saw the rewards of Speed’s work in the second half of the campaign, beating Montenegro, Switzerland and Bulgaria and deserving to beat England but falling just short at Wembley. This meant there was real optimism for our next campaign, which would have the team Speed wanted from the very start, allowing us to give it a good go when it really mattered – not when we’d already stopped checking SkyScanner for flights to Rio. Tragically it was not to be, as Gary Speed passed away from his battle with depression before the campaign begun. I got a text from someone I barely speak to saying “Do you know what’s going on with Gary Speed?” I initially ignored it, thinking he was talking about the great revival that Wales had enjoyed and was going to ask me about getting him a ticket for a game. It wasn’t until 20 minutes later that I checked my phone and found several more messages asking “Is it true about Speed?”. I was concerned, thinking he might have been offered a job at a Premier League club and was leaving us. I raced to the BBC Sport homepage and saw that it was much, more worse than I could possibly have imagined. Our leader, our most capped outfield player and our former captain had gone. I didn’t go to the next few Wales games, the first time since my first game in 1996 I had missed consecutive home matches for the national side. I didn’t want Chris Coleman to be the manager, because I didn’t want ANYONE to be the manager apart from Speed. Eventually I came back, but I didn’t know if I could ever feel the same way about the team after what had happened. That was until I realised that although Gary Speed had passed away, we didn’t lose him. His spirit is personified perfectly by the 11 players on the pitch, his name is sung from the stands in every game, and his dream of taking a Welsh side to a major tournament is more alive than ever. After a 0 – 0 draw in Belgium and a 3 – 0 win in Israel we dared to dream that it was finally happening for the first time since 1958, but this was the night it was time to stop dreaming and start believing. The atmosphere before the game was like nothing I have ever known for a Wales fixture. So many of our more casual supporters had (understandably) been driven away by years of failure, uncaring players and uninspiring football. Those issues have been melted away with the fire of a dragon who roars once more, taking Wales to places they have never been before. Welsh band the Super Furry Animals performed before kick-off, closing their set with ‘I’ve got a fire in my heart for you’. There could not have been a more fitting choice, this Welsh team has put a fire in the football heart of the country once more. There was a better atmosphere in the 45 minutes before kick off than there had been at any point during a home game since 2002, and the roar when the players emerged told you that this was going to be something special. Quite how special was still to be revealed. After a spine chilling rendition of the anthem it was straight down to action, with Belgium quickly showing why they are rated as the second best side in the world. They were absolutely all over us in the first 15 minutes, in previous years we would have crumbled, let in a couple of goals and left the 3,000 or so travelling Belgians to party for the rest of the game. Not this time. The sold out home crowd of 30,000 came together as one to back the team and inspire them to levels of performance that didn’t seem possible. A defence made up of players from Reading, Hull City and Swansea stood up to Eden Hazard (player of the year in England), Kevin De Bruyne (player of the year in Germany) and Christian Benteke and said “Not today. Not here”. They throw themselves into every tackle with everything they had. They blocked the ball with any part of their body they could throw in the way, and when one of them was not able to stop an attacking, one of their mates was there to do it for them. Together stronger has been the motto for the campaign, and it’s never been more true than it was here. After the chaos of the opening 15 minutes when I was worried we’d suffer a significant defeat and lose the momentum for the campaign, the home side grew into the game and began to enjoy some possession and chances of their own. The noise inside the stadium was something I didn’t think I would ever hear in the UK again. It was honestly as loud as the most recent Belgrade Derby I attended. Never mind the cliche of Wales having a 12th man, they had a 13th, 14th, 15th and 16th in the stands with them. 25 minutes played. After the nervy start, Wales are enjoying a good spell and Belgium are showing signs of panic that this might not be as easy as their 2 – 0 victory here in the last campaign. Nainggolan attempts perhaps the worst backpass in the history of football, the ball dropping to Gareth Bale inside the penalty area. With one movement he turns on the ball, and fires it between the legs of Courtois into the back of the net. Instant mayhem. There was a kid who was roughly 14 years old stood in the row in front who’ll probably need a note from his mum to excuse him from school on Monday, because my celebration absolutely wiped him out. I’ve been to a lot of matches at Cardiff City Stadium, and it’s never shaken like this. The outpouring of joy was not just celebrating a goal, it was celebrating a rebirth of the national team, 57 years of disappointment drifting away into the night sky, replaced by the rarest of emotions for our supporters – belief. There were still 65 minutes of football to be played after the goal, and it felt like 65 hours to most people within the stadium. I remember looking at the clock after 32 minutes, looking back what felt like an eternity later to see if we were in to injury time, and it said 33:10. Despite the clock moving at the same speed as a snail on ketamine, the belief never wavered. Not for the rest of the first half, not for the 10 minutes after half time when Belgium had what felt like a million corners in a row, not ever. 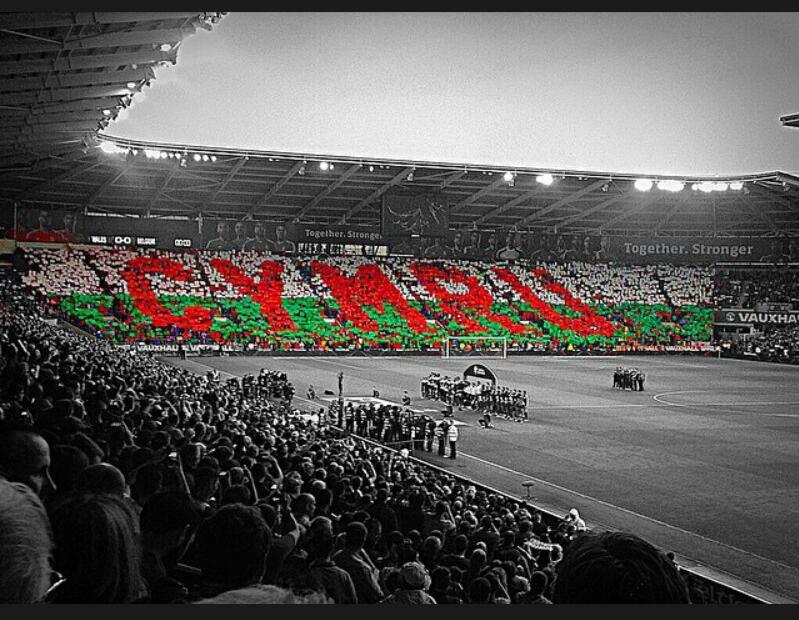 Zombie nation has become the latest Welsh football anthem thanks to a half time party in Brussels, and it was joined by many of the old favourites, including the poignant tribute to Gary Speed – this was his triumph as much as it was anyone elses. With 20 minutes to go, the Welsh fans produced one of the best things I have ever seen or heard inside a football stadium anywhere in the world. Indeed, when I reached this part of the article I had to stop for a couple of minutes and go for a walk around the house to get rid of the chills it gave me. The Welsh anthem is one of the most beautiful in the world, and I don’t think it has ever been sung quite like this. I rewatched it on YouTube to check it was as good as I remember, and the Sky commentator remarks “Time just stood still while they were doing that”, and indeed it did. When the first line of the anthem was belted out Belgium were on the attack, but the greatest ever rendition of the greatest anthem stopped them dead in their tracks. It was the most powerful impact I have ever seen a crowd make on a football game, and I have seen a lot of powerful crowds! After that moment I knew we had won. Even if Belgium scored twice and won the game, we had won. Welsh football was back from the dead and our time has come. Not even the team that wins the trophy next year will have a moment like that. When I’m too old to go to football anymore and sit in my armchair telling my grandkids about how I used to hide flares down my pants, fall over seats and get beaten up by Italian policemen, I’ll tell them about this moment. When somebody asks why football is my greatest and longest passion, I’ll tell them about this moment. In the future when Wales are disappointing again, I’ll think about this moment and remember exactly what makes supporting this team so rewarding, despite the fact we’ll never win a trophy. If I had a super power which allowed me to relive one moment over and over again, it would be this one. Still the clocked moved slowly on, and still the Welsh fans sang. 15 minutes to go now, and it’s still 1 – 0! Ten minutes to go, our defenders are repelling wave after wave of attacks and Gareth Bale is dead on his feet, but it’s still 1 – 0! Just minutes left, and Belgium win 4 or 5 corners in a row, but somehow, any way we can, they are repelled once more. Courtois goes up for a corner and I had a terrible flashback of the moment I saw Reading’s goalkeeper score a 97th minute equaliser, but our rock solid defenders came out on top once again. King Leonidas and his 300 Spartans have officially been outdone for the title of most heroic defence by Wayne Hennessey, Chris Gunter, Ashley Williams, James Chester and Jazz Richards. Every single one of them put in the performance of their lives, especially captain Ashley. I don’t think any player has improved more dramatically following Swansea’s rise to success than Williams, he has evolved from someone I never rated as any better than average to an absolute giant in the heart of our defence, there’s simply no nerves when he has the ball or squares up to an attacker, you know he’s going to take care of it. The 90th minute arrived, and there was yet another magnificent rendition of our anthem. I had bellowed the one on 70 minutes with what was left of my voice, but I was too nervous to even open my mouth for this one. We didn’t win this type of game. We never win this type of game. Injury time seemed to last forever, the two minutes indicated surely becoming at least four. It didn’t matter. There was to be no equaliser for Belgium, and the final whistle sent the stadium into a scene of pure madness. I hugged half of the population of Wrexham. I danced to zombie nation on my seat with the drunkest man in the world. I bashed my shins off what felt like every seat in the stadium, and I noticed that my right trainer had come completely apart during the celebrations earlier in the game. The never-ending joy was reflected by 30,000 others, the Canton End of the stadium a sea of dancing green, yellow and red bucket hats. It wasn’t as good as Italy in 2002, it was ten times better. As chaos erupted all over the stadium, there was one area of calm – on the field. The entire squad gathered in a huddle in the centre circle, the unity of the team being perfectly displayed for all to see. 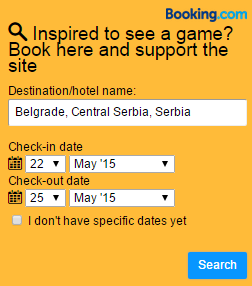 The job isn’t done yet, but it will be if we get two wins from games against Andorra, Cyprus and Israel. Even with the memory of all the false dawns in the past, there is nothing that can stand between Wales and the dream of a nation now. Posted on June 13, 2015, in General. Bookmark the permalink. 11 Comments. Reblogged this on Jamie Thomas' Blog 🙂. Outstanding blog mate. You summed it up to a tee! Thank you kind sir for your column it was pure enjoyment to read. Nice report! Will you be standing on vak W again next season? Brilliant article, took me right back to the game. When we sung that anthem it was a special moment for sure.